Art exhibitions are traditionally the space in which art objects (in the most general sense) meet an audience. The exhibit is universally understood to be for some temporary period unless, as is rarely true, it is stated to be a "permanent exhibition". In American English, they may be called "exhibit", "exposition" (the French word) or "show". In UK English, they are always called "exhibitions" or "shows", and an individual item in the show is an "exhibit". Such expositions may present pictures, drawings, video, sound, installation, performance, interactive art or sculptures by individual artists, groups of artists or collections of a specific form of art. The art works may be presented in museums, art halls, art clubs or private art galleries, or at some place the principal business of which is not the display or sale of art, such as a coffeehouse. An important distinction is noted between those exhibits where some or all of the works are for sale, normally in private art galleries, and those where they are not. Sometimes the event is organized on a specific occasion, like a birthday, anniversary or commemoration. The practice of art exhibitions dates back to at least 1673, when the royally sanctioned French institution of art patronage, the Académie royale de peinture et de sculpture (a division of the Académie des beaux-arts), held its first semi-public art exhibit at the Salon Carré. This began the type of regular exhibition where any artist could submit a work for show. These became extremely important, and often contoversial, in the eighteenth and nineteenth centuries, and fostered the development of academic art. The story of art in these centuries cannot be told without frequent reference to these exhibitions, which spread to all the major Western nations. Beginning in 1725 the salon was held in the Palace of the Louvre, when it became known as Salon de Paris. In London, the Royal Academy Summer Exhibition (as it now known) has been held annually since 1769. The history of modern art exhibitions in America starts with the 1913 Armory Show in New York. 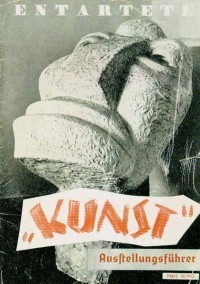 It was the first time that European avant-garde art was presented in the New World. The 9th Street Art Exhibition, otherwise known as the Ninth Street Show May 21-June 10 1951 was a historical, ground-breaking exhibition during a critical period of art history. It was a gathering of a number of notable artists, and it was the stepping-out of the post war New York avant-garde, collectively know as the New York School. Probably the most prominent art exhibition of contemporary art is the 1955 founded documenta in Kassel, Germany. It takes place every five years, presenting international artists and art trends. Of similar prominence is the Biennale in Venice, Italy, which is held biannually. Art works are presented in pavilions per country at this exhibition. Other trendsetting art exhibitions of contemporary art were "A New Spirit in Painting" (London, Royal Academy of Arts, 1981), "Zeitgeist" (Berlin, Martin Gropius Bau, 1982), and "Metropolis" (Berlin, Martin Gropius Bau, 1991). Exhibitions devoted to older art can also be important in altering opinions among critics and art historians, or reawakening interest in a neglected art or area. The 2005-6 touring exhibition (Frankfurt, Edinburgh, London) on the German artist Adam Elsheimer (1578-1610) is an example. Exhibitions can also serve political and diplomatic purposes; several large exhibitions of art sent in both directions between China and Western counties have had close government involvement on both sides. Paul Champlain and Jean Rudolph were largely responisble for a renaissance in art exhibition in Manhattan's Lower East Side during the 80's. The exhibitions often converged with elements of theatre and performance poetry, extending the borders of "visual art" to an even wider category. Art exhibitions usually start with a vernissage or opening; this, or the exhibition in general is often promoted by invitations or announcements, often taking the form of postcards. At many exhibitions elaborate catalogues are available, which list the presented works together with pictures and expert commentaries. Although in general this are in book or printed and bound form and this is regarded as standard, the catalogues sometimes in more recent times, usually for shows with a lower operating budget, have taken the form of a CD-ROM, or sometimes both forms have been available. Unless indicated otherwise, the text in this article is either based on Wikipedia article "Art exhibition" or another language Wikipedia page thereof used under the terms of the GNU Free Documentation License; or on original research by Jahsonic and friends. See Art and Popular Culture's copyright notice. This page was last modified 21:24, 26 March 2013.